Luis Moreno is a certified Safety and Health Official with experience in consulting and training a variety of companies including, but not limited to, construction, mining, military, oil and gas, and public and private higher education. He is also a certified American Heart Association Trainer, Hispanic Contractors Association Instructor, 40 Hour Trainer, OSHA 500 and OSHA 501. He is responsible for deploying proactive processes, systems, tools and metrics to drive the safety department’s continuous improvement and optimize performance as well as develop, review, and enforce corporate and site-specific safety policies and procedures at Guy Roofing. Our safety training program is designed to meet all OSHA requirements and is kept up-to-date on a daily basis. All workers complete a new hire orientation, and continuing training is completed throughout the year - revisiting both complex and simple tasks to ensure our crews are up-to-date. Supervisors receive additional training to continue improving their safety acumen with topics ranging from hazard analysis to working with property managers, to ensure that potential injury to Guy Roofing personnel and outside personnel are appropriately mitigated. Safety is our priority and giving our employees the tools to be successful is our objective! Our safety record is superior among companies in our industry. At Guy Roofing, the health, safety and security of our employees and customers are very important. We are committed to achieving health and safety excellence throughout our entire organization daily. Our employees are our greatest resource –– for without them, our company cannot exist. Our goal is to have ZERO work related accidents. Guy Roofing develops a site specific plan and provides guidance, requirements and delineate responsibilities at each job site as specified by the property owner, hosting facility, and General Contractor. 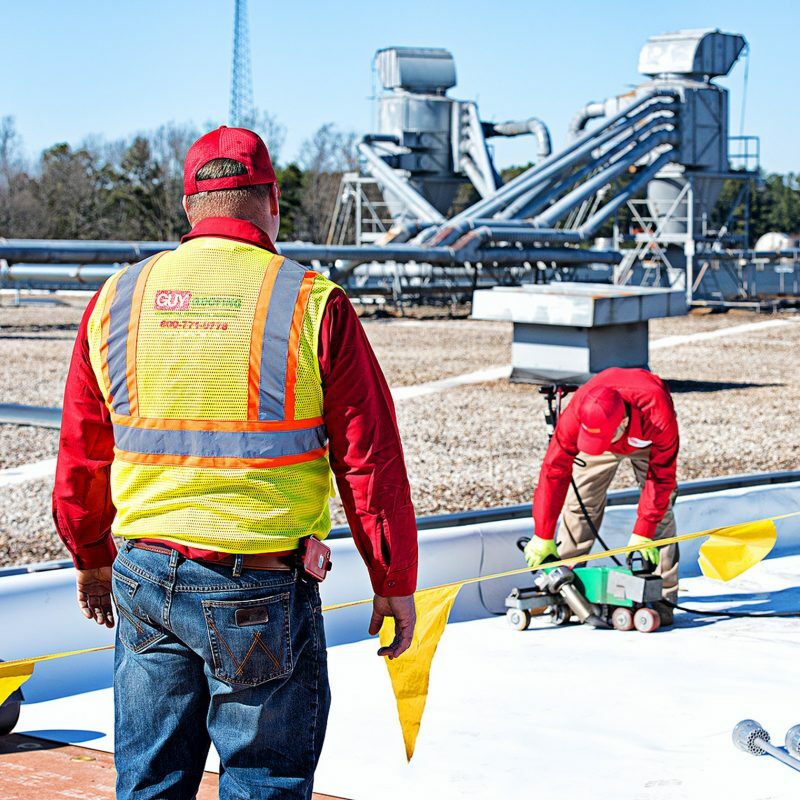 The Guy Roofing site-specific policy emphasizes our management’s commitment to provide a safe work environment for personnel working at heights and the fact that safety of personnel during performance of their work is of the utmost importance. Want More Information on our Safety Program?